Do you use Gowalla or Foursquare? 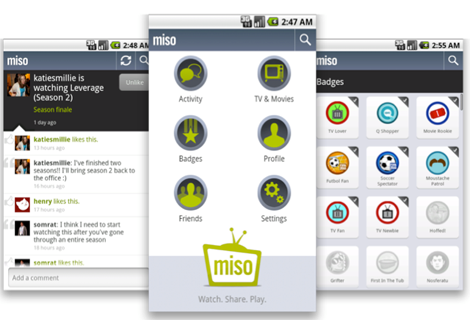 Miso is sort of like these applications, except you can tell your friends what you are watching via a check in. Sometimes this will make for better conversation between friends instead of letting everyone know where you have been that day. Like Foursquare and Gowalla, there are badges as well. Socialize and chat with your friends and other TV fans by liking and commenting on any check-in to any show. See what TV shows are currently trending among all Miso users and discover new shows. Use voice search, a cool Android feature that makes finding your shows as easy as saying the show name! Unlock badges and earns points for your all your check-ins. View all your earned badges and check out hints for badges you haven't earned.